The crowdfunding campaign was supposed to end at midnight, March 11th. Okay, we probably should have noticed the error earlier. To be honest, we find the situation a bit humorous, this is a minor glitch compared to the other problems we’ve had with the software. If you thought you had two days left to sign up and still want to, let us know. Frankly, we’re focused on the next prototype and will be publishing an updated schedule soon. And we’ll pay extra attention to the calendar. We’re testing a prototype with the hold-down tabs mounted to the lid. So far it looks good but it complicates the mold. Part of the complication is making the tabs user configurable. The good news: it seems, (to us anyway) that it’s easier to handle in the dark. The bad news: it will raise the production cost a bit. We’re now estimating retail will be in the $140-$160 range. Now the big news: we’re extending our crowdfunding campaign to March 11th. Obviously, this gives people more time to sign up. We’re really close to the goal; almost close enough that even if we don’t technically reach it, the project could still get the go-ahead. There’s also an engineering reason: the changes we’ve made to the design (moving the hold-down tabs to the lid), means we need to revisit the mold quotes. We don’t expect any major impact to cost or schedule but we want to be sure. We’re very optimistic that the SP-8×10+ will become reality. People started asking for a super-sized version of the SP-445 Film System before it was even in production! If you’ve followed our blog and newsletters (you do subscribe, right? if not click here), you know that we’ve attempted several larger prototypes but none of them reached their funding goals. Very disappointing. 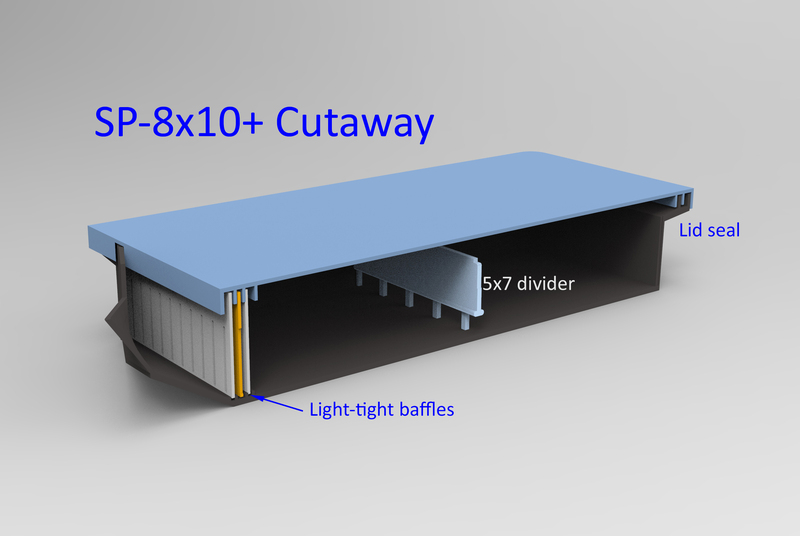 So why do we think the SP-8×10+ will succeed? Simplicity: No frames/holders to fumble with in the dark. Just take the lid off and drop in your film. No seals, O rings or complicated mechanical contraptions. And it requires only 500 ml of chemistry. Flexibility: It will handle anything smaller than 8×10. Simple dividers keep smaller sheets separate. 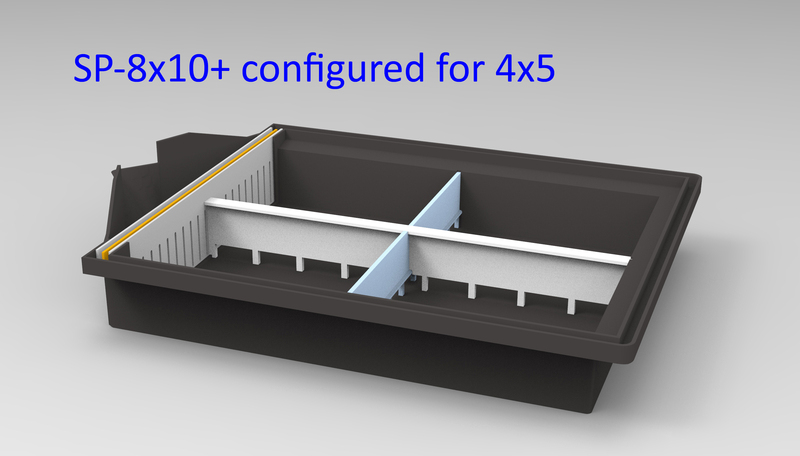 The production version will handle anything between 4×5 and 8×10: 5×7, 4×10, 4×5. Yeah, 9×12 will work too. You should be able to adapt it for those odd-ball sizes that no one else has heard off. Proven: tray processing has been around since, well, the first days of photography. It just works. In fact, we’re so impressed with the concept that we’ve filed a patent. Visit our blog for the latest update! Easy to load: Remember, you have to do this in the dark! It doesn’t get much easier than this. Just take off the lid, drop in the film and put the lid back on. No messing with holders, frames or tubes. To be honest, handling 4×5 is pretty simple. But 8×10? That’s a whole new ballgame and we wanted to keep it simple. 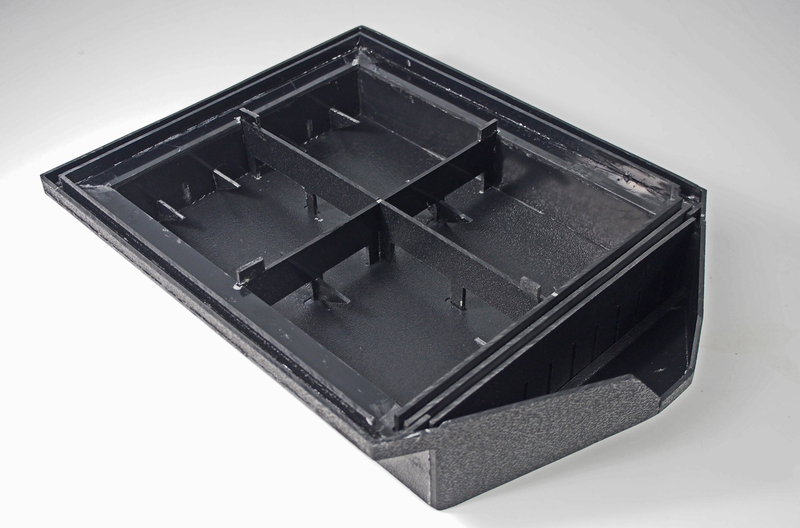 Efficient: traditional trays or dip tanks require gallons processing chemicals! We wanted to avoid complicated seals or a hard to remove lid. No seals to wear out and the lid just drops in place. We originally had designed some really cool latches but found we just didn’t need them. And make it fast. Our baffle design fill/drains in around 10 seconds. The centered pour spout makes filling and draining it a simple operation. We’ve gotten the best results by just lifting the tray (with two hands) and “swirling” the liquid like a gold panner. It’s just a plastic tray, it shouldn’t cost more than your camera. Actually the pricing equation is a bit complicated as anyone who has worked in product development knows. There are a lot of expenses that the accounting department wants accounted for (excuse the pun.) We won’t bore you with the details. We’re estimating the production retail price will be around $150/system (final price TBD) but we’re going to offer early adopters a system for $123. How can you tell that you’ve got the right amount of solution at the right temperature? The fill/drain chamber allows you to see how much liquid is in the tank and easily accommodates a thermometer. Obviously. Since film has a density of around 1.5 grams/cm3 and water, by definition, has a density of 1.0 grams/cm3. So film will sink. Two caveats: first, you have to get past the surface tension. This is why you have to push the film down in tray. But once it’s under water, it will tend to stay there. Second, we’re talking about still water. Flowing water in your wash tray will move the film around. Surface tension is our friend. The big trick is getting the film under the developer quickly and evenly. Since this is a daylight safe tray, you can’t just push it under like Ansel did. Here’s where surface tension comes in: just pre-soak the film. Once the film is wet it flattens out and sink; as you drain the water, surface tension between the back of the film and the bottom of the tray will hold it down as you refill the tray. When the film is submerged again, the surface tension is gone and liquid is allowed under the film to wash away any anti-halation coating. We’ve going to include some hold down tabs just to make sure the film doesn’t tray to float away during the pre-soak (not shown in renderings). Maybe we’re a bit paranoid. We’ve experimented with attaching them to the lid or to the dividers and baffles. Not sure how it will end up. Some things are easier to do horizontally than vertically; handling 8×10 film is one of them. We’ve tried numerous different schemes over the last few years; all of them (until now), involved a vertical tank. They were all awkward to load; especially in a dark box. The SP-8×10+ system is as easy as it gets and doesn’t require as much vertical space. 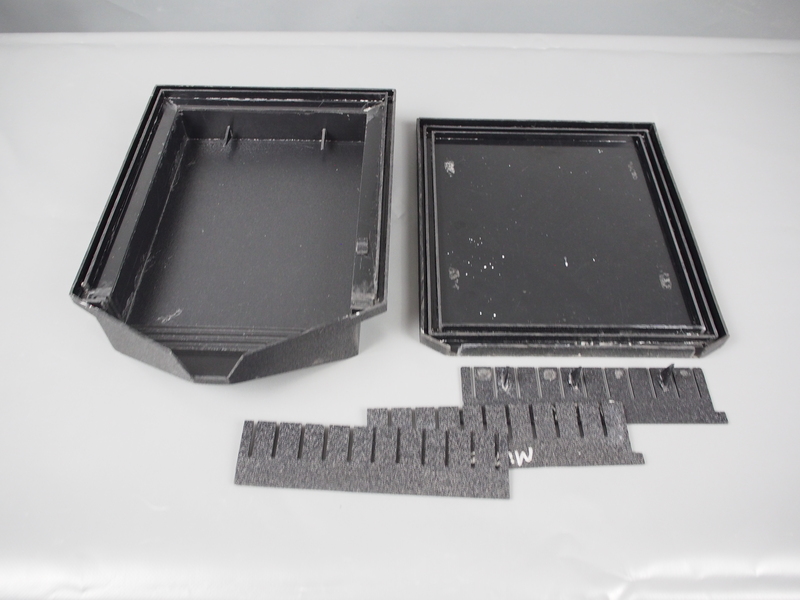 Other sizes: we suspect that the tray will accommodate 13×18 cm; it will probably handle 9×12 cm as well. However, neither has been tested. In theory, you should be able to process any size smaller than 8×10. Glass plates: it will certainly handle glass plates. No special holders required. Two caveats: first, don’t tilt the tray too steeply when draining it. You might cause the plates to fall forward. Second, be careful lifting the plates out, you might need a tool of some kind to get under the edge. First customer shipment: June 3rd. Of course, standard disclaimers apply. As we’ve said before, stuff happens and schedules suffer. However, we’re pretty confident that if the campaign is a success that we’ll be in production in May. Our plan is to ship directly from our warehouse in Hong Kong (and this time iwill come in a really stout box). That would mean arrival at the customer’s address by the end of June. We don’t foresee any major technical risks. After all, this isn’t our first injection mold! In fact, compared to some of our other projects, it’s pretty tame. But you never know. Stuff happens. The biggest undefined feature is the hold down tabs. We’ve tried them mounted to the lid as well as to the baffles/side of the tank. Both work fine and the final design (maybe a combination of the two?) will probably be determined by manufacturing considerations. If the campaign meets it’s funding goal, we’ll put the SP-8×10+ into production as quickly as practical. If the campaign doesn’t meet the funding goal? That’s where things could get interesting. If the campaign isn’t even close to the goal, we’ll cancel the project and refund everyone’s purchase price. However, if it’s close (and we haven’t defined what “close” means), we may decide to proceed anyway. The last scenario brings up an advantage of running in independent campaign: flexibility. For example, if one of our distributors wants to commit to a large pre-order, we can take that into account even if the campaign hasn’t met its official goal. We’ll keep everyone posted as things progress. Please note: Legally speaking, you’re not making a purchase but will receive a “reward” for your support. Just like the big name crowdfunding sites. While this has many implications, the biggest is this: the design may change over the course of the campaign. While we don’t expect anything major, we can’t rule it out. That’s just the nature of product development. Why not two sheets of 8×10? Okay, we knew you were going to ask and we tried. We really, really tried. It may sound like a lot of money but there are three major expenses to consider. Details here.